The Jian (Cantonese: gim), a narrow-blade, double-edged sword, has been respected as the “King of Short Weapons” in China for millennia. Wielding the Jian requires the highest of skill, and the sword user must strive to the heights of spirit and morality. The Jian (Cantonese: gim), a narrow-blade, double-edged sword, has been respected as the “King of Short Weapons” in China for millennia. Wielding the Jian requires the highest of skill, and the sword user must strive to the heights of spirit and morality. In addition to the obvious self-defense uses, swords were commonly carried by scholars for their elegance. Also, because of its beauty, the Jian has always been popular for use in dance. Although the art of the sword has enjoyed a glorious past, its future is uncertain. Modern culture leads people away from its study for several reasons. First, the gun replaced the sword as a personal weapon over a century ago because of its ease of operation and concealment, and greater killing potential. This leads people to believe that sword techniques have no practical value. Second, there are few masters qualified to teach, and thereby to preserve, the artistry of handling the sword. Finally, proficiency in sword techniques requires much time, patience, and practice, and few people today seem willing to exert the energy necessary to learn the ancient art of the Chinese sword. The study and practice of sword techniques, however, like that of any martial art, has value far beyond that derived from merely perfecting the technique due to its intrinsic historical value. This art form has been developing for over 4,000 years and represents a great development of human culture. Sword training promotes good health. Like any sport, perfecting the art of the sword requires extensive physical training, which results in a strong, finely-tuned body. Sword technique retains its personal defense value because it trains one’s perceptions and reactions, allowing for quick and correct response to any situation. Finally, the most important aspect of the art of the sword remains its moral value. The practitioner must learn patience, perseverance, and humility. If the student persists and concentrates, sword art will strengthen his spiritual confidence and power. 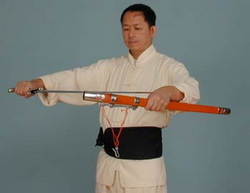 Sword sequences are commonly named for a mountain near where the sequence was created such as Kun Wu Jian, for a style of Gongfu, such as Taiji Jian, or for the person who composed the sequence such as Qi Men Jian. It can also be named by the creator of the sequence as he pleases, such as San Cai Jian (Three Powers Sword). I have been attracted by sword techniques since I started martial arts, when I was fifteen years old. The principles of southern sword, and its manner of use, are very different from those of the northern sword. Nevertheless, since they all build upon the same basic root and theory, once you have learned one, it becomes much easier to pick up the other. I have been more fortunate than many others, since I have had a chance to learn both the southern sword (White Crane) and northern sword (Long Fist). This has provided me with a broader scope of understanding, both in skills and theory. I hope the readers will treat the learning process as a lifelong project instead of a temporary attraction. Only if you have this commitment and attitude, are you able to reach the profound level of the art. Emperor, Huang Di (2690-2590 BC), known as the “Yellow Emperor” because he ruled the territory near the Yellow River, had swords made of jade, copper, and gold. This period marks the beginning of the metallurgical science in arms manufacturing in China. Over time the sword has changed from a short, wide copper weapon to a long, slim steel one because of gradual improvements in metallurgy over thousands of years, and the techniques for using the sword have changed with these changes in qualities. The short, wide copper blade would not hold an edge and was soft, so that it could only be used at short range to hack and stab. Bronze is brittle, as is cast iron, therefore blades made of these materials would break easily when they were used for blocking. The longer the sword the longer the effective fighting range, so that the full array of fundamental techniques in use today were only made possible with the discovery of hardened and tempered steel in this millennium. The number of fundamental techniques has increased significantly from a very few with the early short, wide swords, to more than thirty in use today. It should be 30 inches long, or longer, and the hand guard should point toward the sword tip rather than toward the hand. The taper of the blade from hilt to tip should be smooth and steady, with no abrupt changes of width or thickness. Spring steel blades must be flexible enough to bend 30 degrees and not retain any bow. The dealer may not like this test, so you must be firm about it. The sword should balance at a point one third of its length from the hilt end. If it does not, the balance must be altered or it will not handle properly.